Whether or not you smoke, friends and relatives who visit your home may. It is important, in either case, to be careful with all smoking materials. Don't leave cigarettes, cigars or pipes unattended. put out all smoking materials before you walk away. Don't put ashtrays on the arms of sofas or chairs. The ashtray can be tipped easily, spilling hot ashes or burning cigarettes onto the carpet or furniture. Use large ashtrays with wide lips. While smaller ashtrays may be more attractive, they are not safe. Cigarettes can roll of the edge, and ashes can easily be blown around. Close a match box before striking, and hold it away from your body. Set your cigarette lighter on "low" to prevent burns. Empty all ashtrays into the toilet or metal container. Warm ashes dumped in waste cans can smolder for hours, than ignite surrounding trash. An option is to place the ashtray in the kitchen sink and fill with water. Let it remain overnight before disposing. NEVER, EVER smoke in bed. Make it a rule not to allow any smoking materials in bedrooms. Burning sheets blankets and other bedclothes create a fire from which escape is impossible. Toxic fumes from the smoke can kill. Don't smoke in bed. If you begin to feel drowsy while watching television or reading, extinguish your cigarette or cigar. Do it before it may be too late. The kitchen is a high danger zone for fire, so be extra cautious with flame when cooking in the kitchen. If you must leave the kitchen while you are cooking, turn off the burner. If you have something in the oven, check it every 15 minutes. Most kitchen fires occur because food is left unattended on the stove or in the oven. A "brief" departure from the kitchen to attend to other matters can easily turn into an extended time away. As a reminder to you, take a potholder, a cooking spoon, or other kitchen utensil with you when you leave the room. This object will help you remember that you have an unfinished task waiting in the kitchen. Never cook with loose, dangling sleeves. Robes and other loose fitting garments can ignite easily. This is a major cause of serious burns for senior citizens. Don't take chances! Turns off stove when smoke detected. 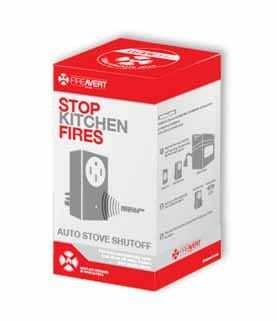 Get FireAlert for you or your loved one. Enter SeniorResource during checkout discount to receive 20% off your order. Regularly inspect your extension cords for fraying, exposed wires or loose plugs. They are not intended for use as permanent wiring. Unplug them when not in use. If you need to plug in two or three appliances, lamps, etc., do not use a simple extension cord. It is better to get a UL-approved unit that has built-in circuit breakers. If you use a wheel chair or walker, check all the exit routes in advance to be sure you can get through the doorways. If not, map out escape routes that are acceptable, and discuss your escape plans with your family, the building manager or neighbors. If you have impairments that might make it more difficult for you to escape from fire, consider talking to your Fire Department and letting them know your special circumstances in advance. Plan your escape route. You should have a primary and a back-up route mapped out for each room. Practice getting out. It may seem foolish to do so, or unnecessary (of course you know how to find a front door), but when there is a fire or smoke, your reasoning and patterns may be affected by the emergency. If you have practiced escape routes, your memory and instinct will help you move in the right direction and in the right way. Check all the windows from which escape is planned. Can you open the window, or is it painted or nailed shut? Make sure your exits allow you to exit! Never use the elevator during a fire! Never leave apartment doors open if you flee a fire.